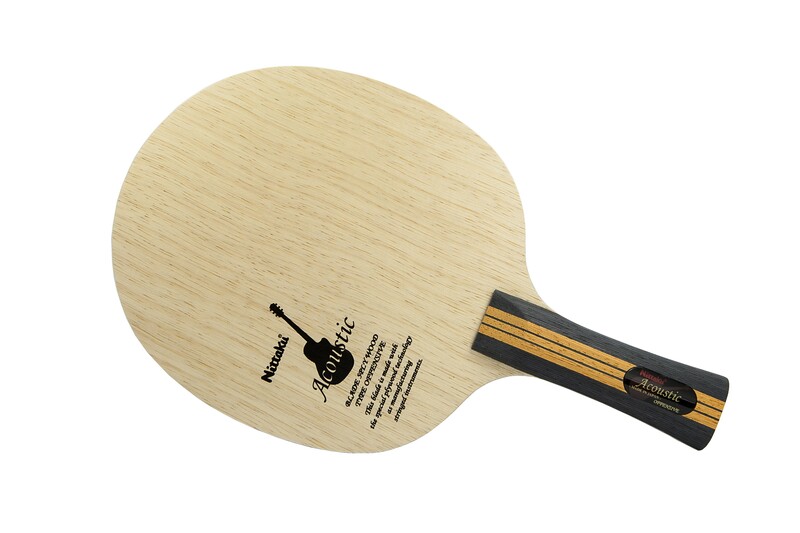 The Nittaku Acoustic was made according to the principles used in making string instruments. The materials used for this blade are thicker and softer than those in the Nittaku Violin. This provides the Acoustic with stable characteristics when attacking and blocking. Made in Japan. Основание исключительно для атаки- по чувству, как бы само приглашает к атаке. Верхние 2 слоя лимбы дают небольшую задержку мяча, потом включается толстый слой tung three, который дает сильнейший импульс. Основание не для начинающих, требует определенных навыков. По скорости и мощности не уступает как мне ощущается композитным основаниям. Но forhand использую Hurricane 3. По чувству звонкое и среднежесткое, качество хорошее. Ручка ST удобная. Very good control. Not too much power. I would say that it is equal to 7 ply in feel and play and having very good control with good speed enough for putting ball away. What it lacks is blocking ability. Passive blocking will not work like carbon blades. Nittaku Acoustics, quality is second to none, feel like an extension of my hand, loop is easier, fast enough for a kill shot, control is superb. I don't know what else to say, it's just really good, the sound and feel is amazing. Great choice for me on their advice. For the longest time, I have wanted to try this blade. I have far too many blades and really didn't need it. But, TT11 put it on weekly special and I couldn't resist. I am very happy to have purchased. The handle feels perfect. From the moment you hold in your hand you know this is a blade with an artisans touch. It is the perfect weight. I paired it with Renanos Hold on FH and Fastarc S-1 on BH. The combo is balanced, powerful and has tons of control. 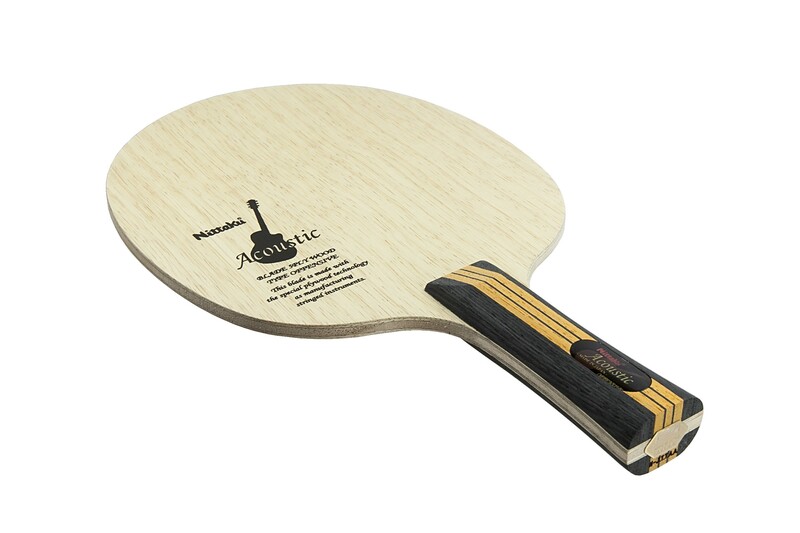 The Acoustic excels at close to table and mid-distance topspin play. Dwell time is medium-high making flicks a breeze. Serves are spinny and blocking is fantastic. I had to adjust my bat angle slightly and then I felt like the ball went exactly where it was supposed to go. My favorite attribute of The Acoustic is it's feel. I am sure many others would agree. The blade just has a wonderful feeling that is hard to describe. The perfect combination of vibration, sound and weight. I tend to be a wanderer in that I like trying new blades. I am not looking for that one blade which elevates my game. It is more curiosity and the enjoyment in learning. Well, curosity landed me on the Acoustic and I am so glad it did. A really nice blade. The finish and quality is truly excellent. My hands are on the smaller side, so the small FL handle fits me quite well. I have paired it with Evolution MX-P 2.1mm rubbers on both sides and more often than enough I find this setup truly satisfying. Best blade I've ever played with. Shipping and handling was very fast. Frame made from very good attack, the series of glued Nittaku frames with the violins of the procedure is of the highest quality. only flaw frame a little heavy. good control, good speed, good rotation. I recommend this frame although I personally prefer the Nittaku violin. One of the best Allwood blade from Nittaku. I love the feel and control of this amazing gem! This blade is high quality and fast and heavy weight. For intermediate and advanced players that good choice. One of the best OFF- blades around. Enough flex for looping. But stable/crisp enough to block well too. Good feedback, no uncomfortable vibration. Using Rakza7 suits it well. After using 10 different blades over a 12 year period, this is my favorite! Its true the FL handle is slightly small... but the Large-FL alternative is like holding a chair leg. It is s really good blade for this price. I use it with Rakza 7 soft rubber on BH and Rakza 7 on FH so with these the weight of the blade is perfect. With Ragza 7 on both sides it was too heavy. It can be easily directed from up close to the table,as well as from further and it is sufficiently fast. But the handle could be a little thicker,but you can get used to it. Spot on, beautiful FL handle. The blade does what ever you wish it to do, superb quality, control, spin and speed! It's a full package, bought it on a discount, otherwise a bit pricy, in my own opinion - worth it! Very good service! Paddle was indeed 89 g and the shipping was fast. Thanks Dmitry! Surprised by the control this blade provided! With xiom omega 2 at FH this blade provides all, outstanding control, crazy spin, very good speed and enough gears. It is to me the best blade to play with at close and mid range! Got mine when it was on sale for about 83. This blade has pretty good dwell time for looping. Very precise to place the ball. The feeling is second to none. If you like short games, it's a perfect weapon. The handle is way too small. The good news is that T11 now offers Acoustic with larger handle in their store. Once again, thanks T11, for the wonderful product and service. Really nicely Finnished off blade of beautiful quality , haven't put rubbers on yet so can't say anything about its playing characteristics. 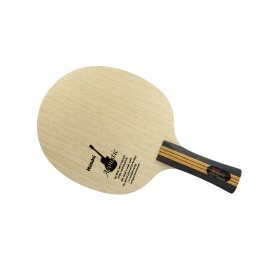 The handles are a little small so be careful if you have big "Ham Fists"
Table Tennis 11 are superb to deal with . This is not my first acoustic, I already have one as my main bat so bought a second as a backup when TT11 had them for sale at 100 euro. It is a do-it-all OFF 5-ply blade; fast but not blazingly so, stiff with a little flex, mid-soft feel. Excellent control for its speed. Very good dwell time. Pairs very well with tensor rubbers. Build quality second to none. They are expensive, but I've given 4 stars for the price I paid; still cheaper than the premium Butterfly offerings and you shouldn't need to replace blades very often after all. This Blade is high quality. Good feeling and vibrations.